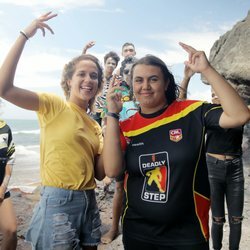 Desert Pea Media is very proud to announce our new collaboration with the Yaegl community in Maclean and Yamba in Northern NSW. This production brought together Elders, community members and young people to create a conversation about culture, country and community. The DPM team feels deeply honoured to learn, share, create and build friendships and connection with the Yaegl community in Maclean & Yamba. These projects not only uplift and inspire audiences and community members, but everybody involved. These are friendships and experiences that all of us really treasure.